On occasion I enjoy spicy food, like a very peppery and salty steak, or a Mexican meal, whenever I visit in California or Texas, a hot Indian Curry or a beautiful Paprikasch that I prepare with sweet and hot Paprika from Hungary. After such a meal – invariably my taste buds scream for Chocolate. Chocolate has many properties and is not easy to work with, especially in the summer time in Maryland or any other place where the temperatures and humidity exceed comfort. Its melting point is just around body temperature – 98.6 F and in the summertime one’s warm hands are higher than that. Whenever I make Chocolate Truffles at this time of year I cool down my kitchen to about 68 F and I dip my hands often into iced water. Once the Truffles are rolled they go quickly into the refrigerator. Yet, at serving time one needs to bring them back to room temperature to allow this beautiful confection melt with ease in one’s mouth while it transports you to another time and place of comfort and pleasure. 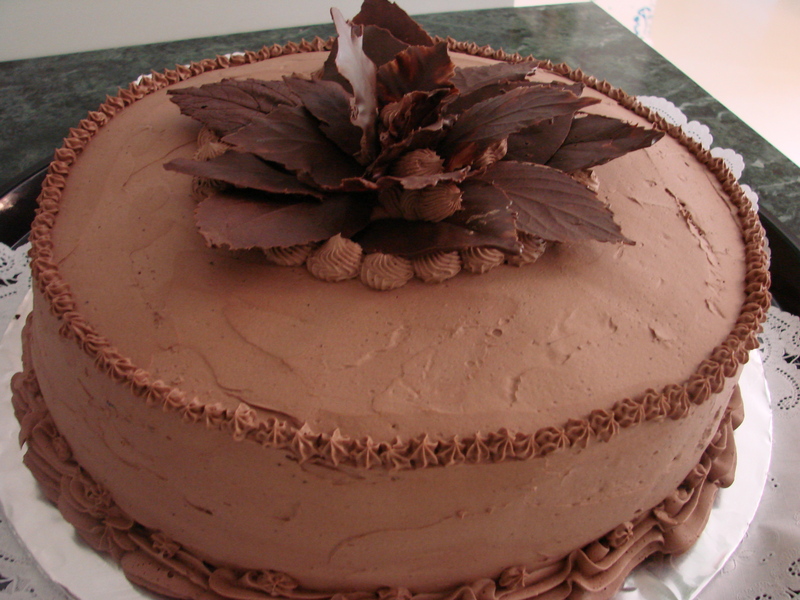 Chocolate creams/fillings are a little easier to handle because the cream is not handled with bare hands, it is mixed in a mixing bowl. But, here too one has to keep temperatures in mind. The butter and creams have to be the same temperature – cool to the touch, and never too close to the melting points. There are many times, while mixing a chocolate cream,that it needs to go into the refrigerator to cool down before proceeding with the recipe. No wonder that baking with Chocolate is quite frustrating to many people. It takes patience and some knowledge about the product. The cake above was a birthday cake. Before I begin to describe the many parts of this cake I want to emphasize that in Austrian, particularly Viennese baking, the cake itself is of little importance. 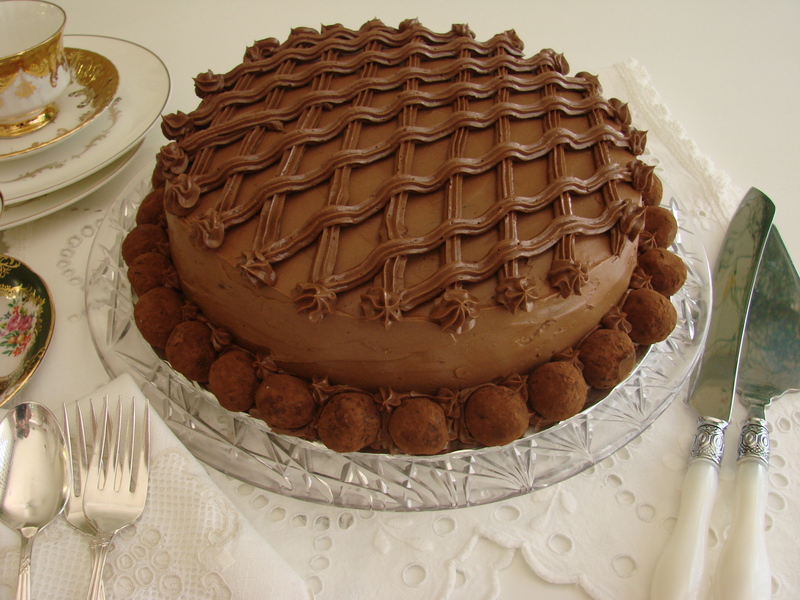 However, the creams/fillings, liqueurs, flavorings, etc are most important, and that is what makes the cake a delicacy. It is like a sandwich………the parts that are between the bread layers make the flavorful and satisfying sandwich experience……..and so it is with a cake. The following cakes are named after the toppings on the cake. Making the above Chocolate Cake……this is not a recipe, just a description of how it was created. The cake had two kinds of chocolate cake layers. One was a dark chocolate cake and the other a milk chocolate cake. 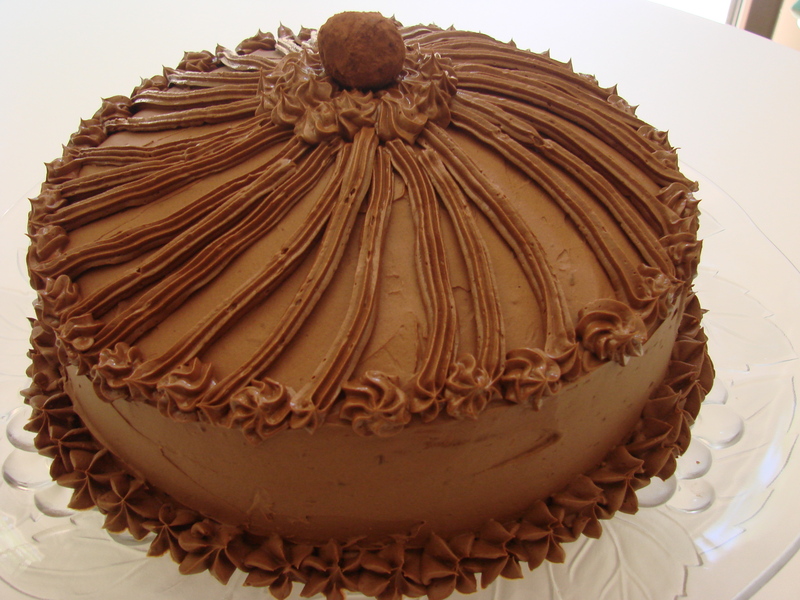 I added some instant espresso coffee into the batter of the dark chocolate cake to make it a Mocha flavored cake. 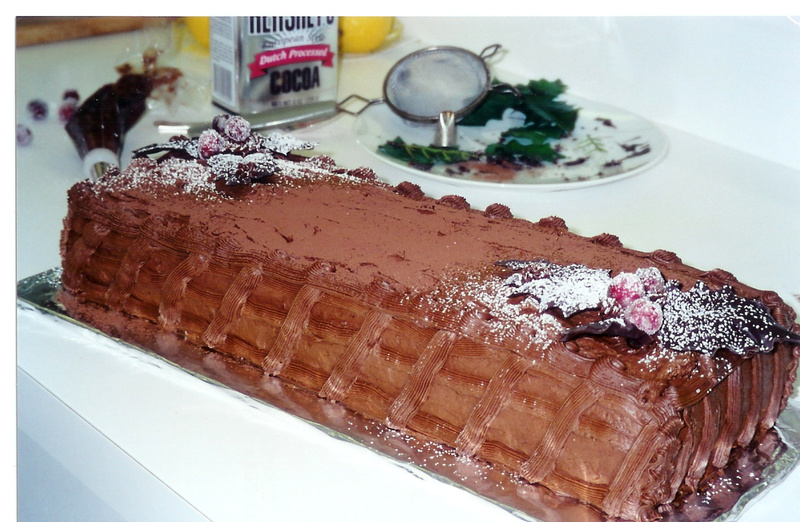 The icing was a butter cream – made up of half pastry cream and the other half was sweet unsalted butter, melted Guittard (60% cacao) Chocolate Chips, Droste Cacao powder, confectioner sugar and Pure Vanilla Flavoring. The other part of the filling was home-made plum jam and Brandy sweetened with confectioner sugar. Filling and layering the cake………. Both cakes were cut into layers and set aside. 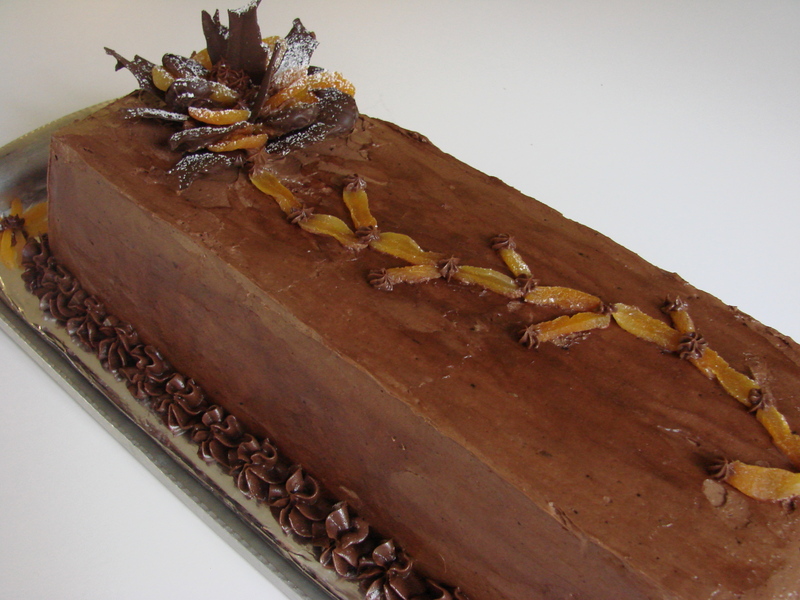 One dark chocolate layer became the bottom of the cake and was placed on a cake platter, brushed with the sweet brandy and topped with the icing – about ¼ inch thick. The next layer was the milk chocolate cake, brushed with the sweetened brandy and topped with the plum jam….just a thin coating. I continued layering the cakes and alternating the fillings. Finally the cake was iced with the butter cream and decorated using Wilton’s decorating tips. 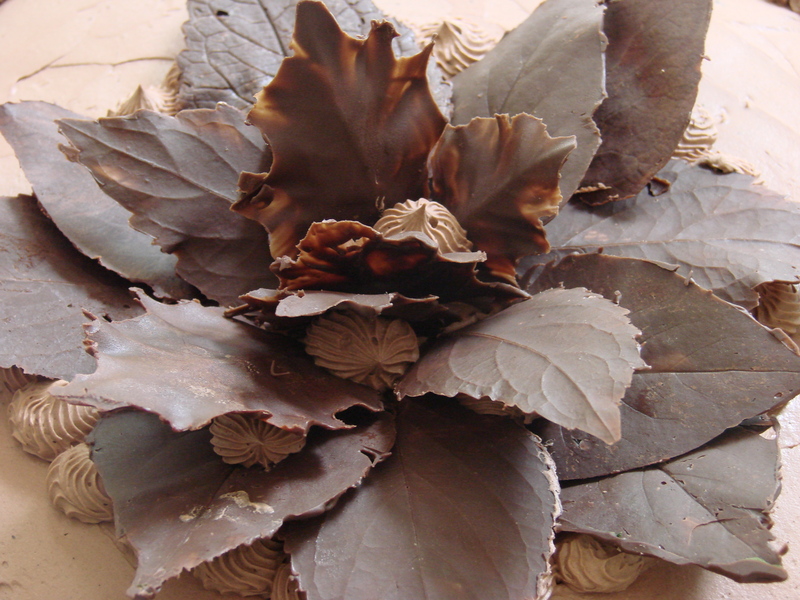 The only decoration on top of the cake was a large chocolate flower that was made of chocolate leaves. 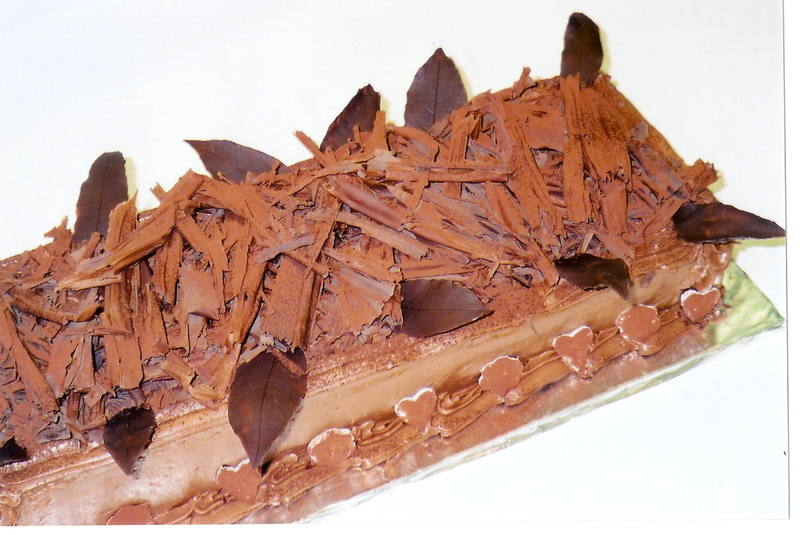 The leaves were held up with small rosettes of icing. It was an elegant presentation. The Chocolate Flower was difficult to make since it was a very warm day and the kitchen did not cool down as I would have needed. But as soon as I put it together I placed the cake into my pastry refrigerator for the night, to be finished with a few little touch-ups and delivered the next day. 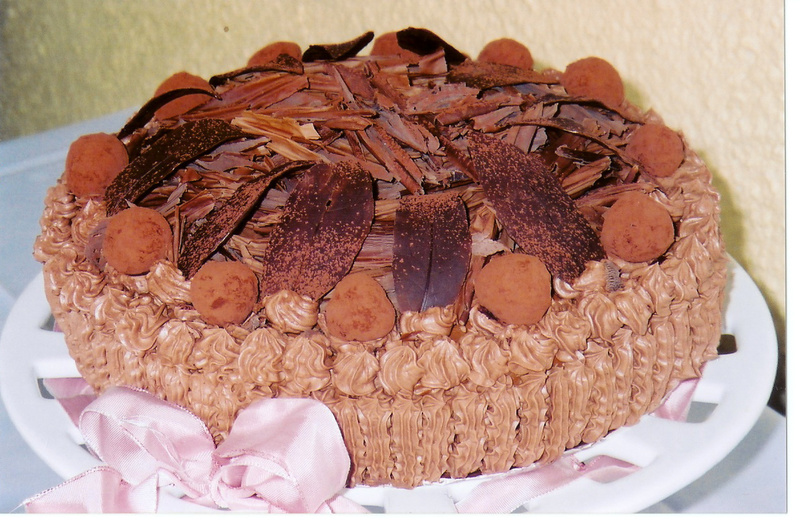 You might like to see other Chocolate Cakes that I have made…….and I have to say, that I have never made the same cake twice when it come to the decor of this ultimate pastry. You are an amazing artist! Simply gorgeous creations. I can’t wait to buy your book!!!!! I’m salivating!!!! Yummmm…. I can almost taste the chocolate melting in my mouth. These cakes are indeed beautiful. How I wish I could bake half as well as you do. Great job! I wish I live closed by you, I would love to taste these. It looks amazingly delicious! You must be Thai! My favourite cuisine is Thai. We were there again Oct-Dec 2009. Once again, to a chocolate lover, you are over the top. How happy many would be if you had a shop so we could enjoy your wonderful art. Consider having desserts and tea on occasion. 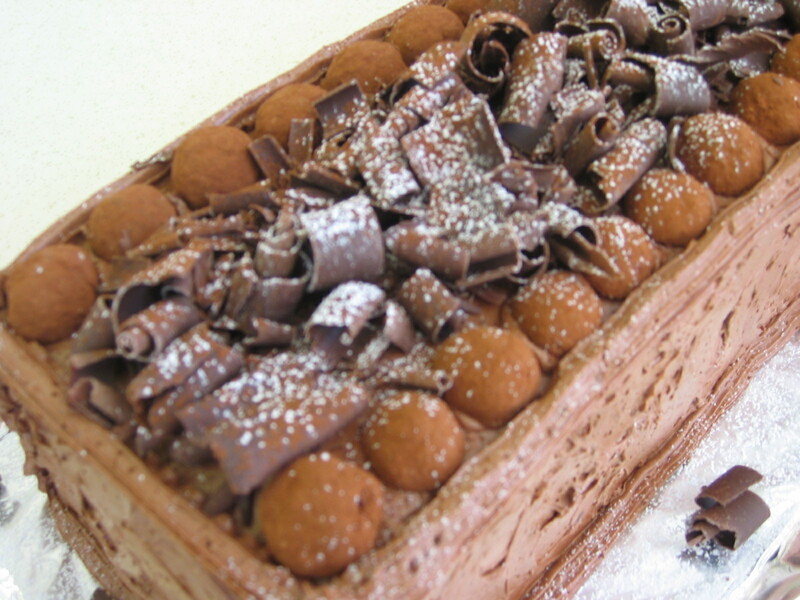 Yummmmmmmm…….you certainly have made me hungry for chocolate cakes. They are beautiful!!!! 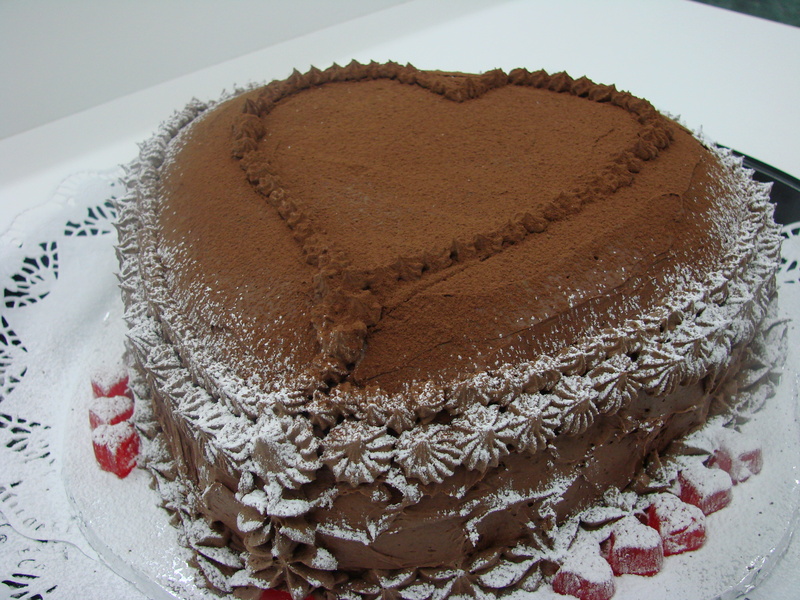 Thank you so much for the lovely chocolate cake. The cake was even more delicious when we finished it on the second day. I love that every one of your cakes tells a wonderful story. Those cakes look wonderful and are very tasty, I’m sure. Would love to eat a big slice right now. As a Hungarian, who has visited both Vienna and Budapest, I can tell you that not all chocolate cakes are created equal. One of the best “Dobos” I ate was in Budapest at a relatives home who used to own a confectioners/bakery before W.W. II. The most delicious “Sacher Torte” (with whip cream) we enjoyed when my husband and I visited Salzburg. Surprise! I expected it to be in Vienna. It was wonderful to meet you yesterday at Charlestown! And now that I’ve had a chance to view your work, I am even more impressed! WOW! I can’t wait to share your information with our Elderhostel folks: they will be very interested to woo you to come share your experience with our residents! Vinson…….thank you for your very kind comment!!!!! It was very nice meeting you as well…….yesterday, and I too hope that we can work together in the future. Charlestown is a beautiful place!!!!!!! Thank you so much for the blog. I went back to read the one on chocolates. The cakes are beautiful. My family is made up of chocoholics. Chocolate should be Samantha’s first name because she would eat chocolate before a meal but so could I. Have a good rest of the summer and I’m hoping Samantha hasn’t outgrown the Gingerbread house this year.